Why Shop At Cities Edge? MON - FRI 10:00 a.m. 6:00 p.m. The rugged and tough Kawasaki KLR™650 motorcycle is built for adventure. 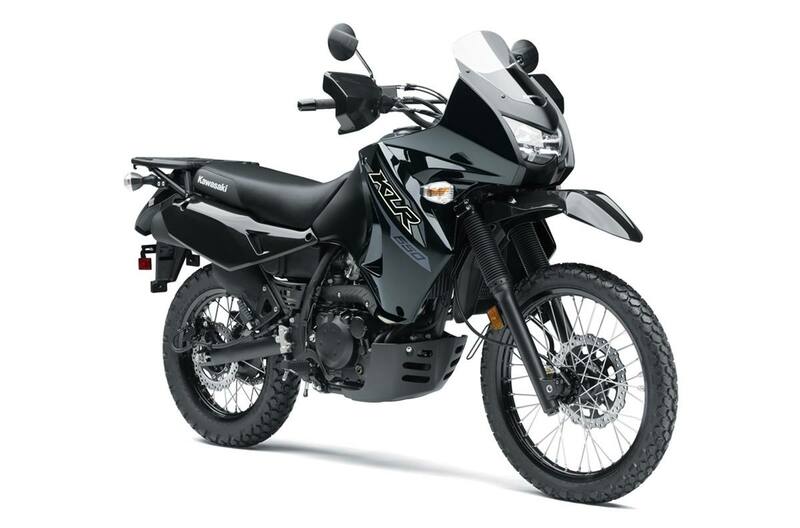 Riders will benefit from the KLR650 motorcycle's phenomenal fuel range and dual-purpose capabilities on pavement or off-road. Rake / Trail: 28.0 deg./4.4 in. Curb weight includes all necessary materials and fluids to operate correctly, full tank of fuel (more than 90 percent capacity) and tool kit (if supplied). KAWASAKI CARES: Always wear a helmet, eye protection, and proper apparel. Never ride under the influence of drugs or alcohol. Read Owner’s Manual and all on-product warnings. Professional rider shown on a closed course. © 2017 Kawasaki Motors Corp., U.S.A.
Kawasaki is pleased to offer the Military Customer Promotion valid through 8/31/19 to all active, reserve, and retired United States military personnel. 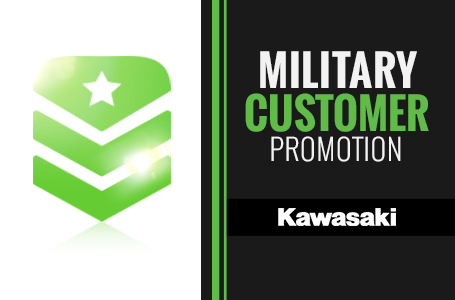 Military customers who purchase any *2019/Prior model year Kawasaki vehicle are eligible to receive an incentive up to $250, applied to the purchase price of the vehicle. Incentive is based on purchased model cc range as follows: $250 for all vehicles. *Eligible Product must be new and unused, for which no retail sales/product registration has been previously submitted to or processed by KMC. (Excludes all current model year Ninja H2™ models and all model year Ninja H2™R). *Military personnel may be required to provide verification of Military status from their U.S. Military ID. Promotional finance offers are available through Citi Retail Services, Synchrony Bank, and Sheffield Financial. Offers valid4/1/19 through 8/31/19. Programs and valid through dates may vary. Please visit your local dealer for more details. *0% APR for 12 months for qualified cardholders (Kawasaki Motorcycles, ATVs, Jet Ski® watercraft, MULE™ utility vehicles or TERYX® recreation utility vehicles). After that the variable APR will be 9.99%-14.99% based on your credit worthiness. *Subject to credit approval and creditworthiness, some options may not be available and other terms may apply. 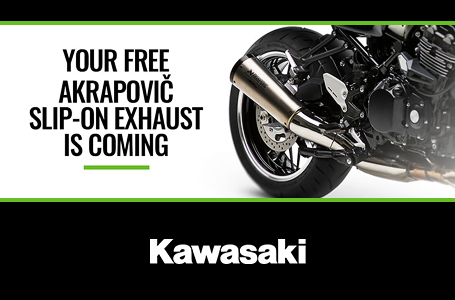 Incentives shown available at participating Kawasaki dealerships, model and year exclusions apply. Subject to change without notice. 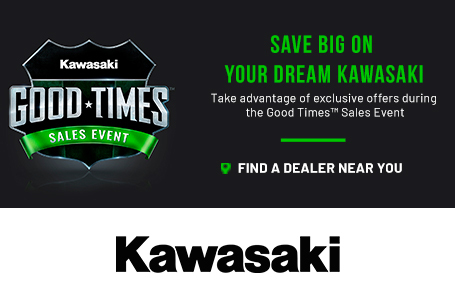 Offer available on approved purchases of select new, unregistered Kawasaki vehicles. Offer valid for a limited time only. *With credit approval for qualifying purchases made on the Kawasaki Card at participating dealers. Depending on credit quality, eligible purchases will be charged no interest for 12 months from the transaction date. Thereafter, you will be charged 9.99%, 12.99% or 14.99% APR depending on credit worthiness. Minimum Interest Charge $2. Valid through 8/31/2019. *With credit approval for qualifying Z900RS (Standard, ABS, and RS CAFE editions excluded) motorcycle vehicle purchases made on the Kawasaki Credit Card at participating dealers. Depending on credit quality, eligible purchases will be charged 3.95%, 4.95% or 5.95% APR for 60 months from the transaction date. After each promotional period ends, the standard variable APR for purchases will be applied to unpaid introductory balances, new purchases and new balance transfers. As of 4/1/19. Purchase APR; standard variable is 24.24%. The Minimum Interest Charge is $2. See card agreement for details. Offer valid 4/1/19 through 8/31/19. *With credit approval for qualifying Kawasaki MULE™ and Teryx® side x side vehicle purchases made on the Kawasaki Credit Card at participating dealers. Depending on credit quality, eligible purchases will be charged 8.95%, 11.95% or 15.95% APR for 84 months from the transaction date. After each promotional period ends, the standard variable APR for purchases will be applied to unpaid introductory balances, new purchases and new balance transfers. As of 4/1/19. Purchase APR; standard variable is 24.24%. The Minimum Interest Charge is $2. See card agreement for details. Valid 4/1/19 through 8/31/19. Monthly payments required. Valid on Amount Financed of $5,000 or more on select new previously unregistered Kawasaki Motorcycles, All Terrain Vehicles, Personal Watercrafts, MULE™ utility vehicles, TERYX® recreation utility vehicles made between 4/1/19 through 8/31/19 on your Kawasaki / Synchrony installment loan account. Model & year exclusions apply. *An Introductory Rate of 0.00%, and a post-introductory rate of 9.95%, 10.95%, or 14.95% will apply. Example 1: A total 60-month term with an Amount Financed of $10,000: 0.00% rate for the first 6 months and 9.95% rate for remaining 54 months requires monthly payments of $166.67 for the first 6 months, and $207.43 for the remaining 54 months. APR of 7.96%. Example 2: A total 60-month term with an Amount Financed of $10,000: 0.00% rate for the first 6 months and 10.95% rate for remaining 54 months requires monthly payments of $166.67 for the first 6 months, and $211.83 for the remaining 54 months. APR of 8.75%. Example 3: A total 60-month term with an Amount Financed of $10,000: 0.00% rate for the first 6 months and 14.95% rate for remaining 54 months requires monthly payments of $166.67 for the first 6 months, and $229.97 for the remaining 54 months. APR of 11.88%. Program minimum amount financed is $5,000 and 0% - 10% down payment required. Rate and down payment based on credit approval criteria. Offer is subject to credit approval by Synchrony Bank. Monthly payments required. Valid on amount financed of $5,000 or more on select new previously unregistered Kawasaki Z900RS motorcycles (excludes Z900 and Z900RS CAFE models) made between 4/1/2019 through 8/31/2019 on your Kawasaki / Synchrony installment loan account. Model & year exclusions apply. Monthly payments required. Valid on Amount Financed of $2,500 or more on select new previously unregistered Kawasaki models made between 4/1/19 through 8/31/19 on your Kawasaki / Synchrony installment loan account. Model & year exclusions apply. *Rate of 4.95%, 9.95%, 12.95%, or 13.95% will be assigned. Example of monthly payments over a 36-month term at a 4.95% rate: $29.95 per $1,000 financed; and over a 36-month term at a 13.95% rate: $34.15 per $1,000 financed. Program minimum amount financed is $2,500 and 0% - 10% down payment required. Rate and down payment based on credit approval criteria. Offer is subject to credit approval by Synchrony Bank. Monthly payments required. Valid on Amount Financed of $5,000 or more on select new previously unregistered Kawasaki models made between 4/1/19 through 8/31/19 on your Kawasaki / Synchrony installment loan account. Model & year exclusions apply. *Rate of 6.95%, 9.95%, 12.95%, or 14.45% will be assigned. Example of monthly payments over a 60-month term at a 6.95% rate: $19.78 per $1,000 financed; and over a 60-month term at a 14.45% rate: $23.50 per $1,000 financed. Program minimum amount financed is $2,500 and 0% - 10% down payment required. Rate and down payment based on credit approval criteria. Offer is subject to credit approval by Synchrony Bank. *Rate of 7.95%, 10.45%, 13.45%, or 14.95% will be assigned. Examples of monthly payments over a 72-month term at a 7.95% rate: $17.51 per $1,000 financed; and over a 72-month term at a 14.95% rate: $21.12 per $1,000 financed. Program minimum amount financed is $5,000 and 0% - 10% down payment required. Rate and down payment based on credit approval criteria. Offer is subject to credit approval by Synchrony Bank. *Example: On a purchase where the Amount Financed is $7,500, your Down Payment is $0 with 60 monthly payments of $128.31 each. Interest Rate is 4.45% [ANNUAL PERCENTAGE RATE is 4.45% (E)]. *Example: On a purchase where the Amount Financed is $7500.00, your Down Payment is $0.00 with 36 monthly payments of $224.61 each. Interest rate is 4.95% [ANNUAL PERCENTAGE RATE is 4.94899% (E)]. *Example: On a purchase where the Amount Financed is $7500.00, your Down Payment is $0.00 with 60 monthly payments of $148.32 each. Interest rate is 6.95% [ANNUAL PERCENTAGE RATE is 6.94657% (E)]. *Example: On a purchase where the Amount Financed is $7500.00, your Down Payment is $0.00 with 66 monthly payments of $138.99 each. Interest rate is 7.49% [ANNUAL PERCENTAGE RATE is 7.48877% (E)]. *Example: On a purchase where the Amount Financed is $7500.00, your Down Payment is $0.00 with 72 monthly payments of $131.31 each. Interest rate is 7.95% [ANNUAL PERCENTAGE RATE is 7.94828% (E)]. *Example: On a purchase where the Amount Financed is $7500.00, your Down Payment is $0.00 with 84 monthly payments of $120.47 each. Interest rate is 8.95% [ANNUAL PERCENTAGE RATE is 8.94793% (E)]. *Example: On a purchase where the Amount Financed is $7,500, your Down Payment is $0 with 60 monthly payments of $141.35 each. Interest Rate is 4.95% [ANNUAL PERCENTAGE RATE is 4.95% (E)]. *Example: On a purchase where the Amount Financed is $7,500, your Down Payment is $0 with 66 monthly payments of $131.76 each. Interest Rate is 5.45% [ANNUAL PERCENTAGE RATE is 5.45% (E)]. *Example: On a purchase where the Amount Financed is $7500.00, your Down Payment is $0.00 with 60 monthly payments of $159.15 each. Interest rate is 9.95% [ANNUAL PERCENTAGE RATE is 9.94502% (E)]. *Example: On a purchase where the Amount Financed is $7500.00, your Down Payment is $0.00 with 66 monthly payments of $150.02 each. Interest rate is 10.49% [ANNUAL PERCENTAGE RATE is 10.48603% (E)]. *Example: On a purchase where the Amount Financed is $7500.00, your Down Payment is $0.00; no interest for 6 months with 60 monthly payments of $152.89 each. Interest rate is 9.95% [ANNUAL PERCENTAGE RATE is 8.23% (E)]. *Example: On a purchase where the Amount Financed is $7,500, your Down Payment is $0 with 60 monthly payments of $144.81 each. Interest Rate is 5.95% [ANNUAL PERCENTAGE RATE is 5.95% (E)]. *Example: On a purchase where the Amount Financed is $7,500, your Down Payment is $0 with 66 monthly payments of $135.27 each. Interest Rate is 6.45% [ANNUAL PERCENTAGE RATE is 6.45% (E)]. KAWASAKI CARES: Read Owner's Manual and all on-product warnings. Warning: ATVs can be hazardous to operate. For your safety: Always wear a helmet, eye protection, and protective clothing. Never carry a passenger. Never ride under the influence of drugs or alcohol. Never ride on public roads or pavement. Avoid excessive speeds and stunt driving. Be extra careful on difficult terrain. Kawasaki ATVs with engines over 90cc are recommended for use only by persons 16 years of age or older. Kawasaki also recommends that all ATV riders take a training course. For more information, see your dealer, call the ATV Safety Institute at 1-800-887-2887, or go to www.atvsafety.org. ©2019 Kawasaki Motors Corp., U.S.A.